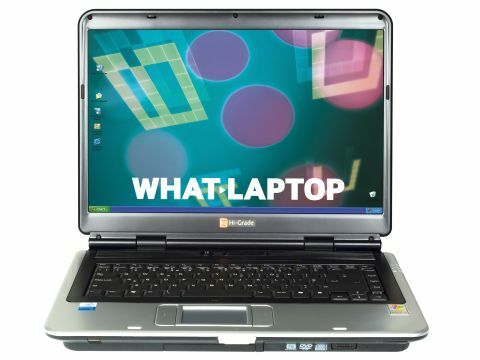 Hi-Grade is a UK-based manufacturer known for its affordable laptops. Offering efficient performance and features aimed at the new laptop owner is the Hi-Grade Notino W5500-1700 (£499 inc. VAT). With a 15.4-inch widescreen panel and dimensions of 357 x 272 x 48mm, the chassis strikes a balance between mobility and usability. Its 2.9kg weight is common to most laptops in its price range. Unfortunately, the battery lasted for just 154 minutes, under test. Keeping costs low, basic components have been used without sacrificing performance. An Intel Pentium M 740 processor and 512MB of memory suit basic home and office tasks. This was shown by a MobileMark 2005 benchmark score of 193 points - a decent result at this price. For copying data to external discs, a dual-format recordable DVD drive is in place. However, the locking mechanism on our test system proved to be over-sensitive, and the drawer frequently ejected after any contact with the drive. At this price, multimedia performance is low. Using an integrated SiS 661FX graphics chip, its 3DMark 2003 score of only 93 points was the lowest in the group. This won't hinder basic use, but anything more graphically intensive will be impossible. The widescreen aspect ratio of the display is ideal for spreadsheet use and watching DVDs. The 1280x800 pixel (WXGA) resolution limits screen space, but there's still room for working across multiple documents. Brightness is too low for sunny days, but won't limit indoor work. As with all laptops in this review, high-speed 802.11b/g wireless networks can be configured. Ethernet connections are limited to the slower 10/100 Base-T speed, but this won't pose a problem for most users. While the keyboard is well-designed and responsive, the touchpad button design is one of the worst we've seen. Instead of placing the buttons below the touchpad, they're fitted on either side. Hugely restricting ease of use, this is a very poor design choice. Helping new users get started, without adding extra cost, Hi-Grade has included OpenOffice software suite. Delivering similar usability to Microsoft Office, but with free updates and no hidden fees, this means one less cost for the end user. Providing an affordable and competent starting point for the new laptop buyer, only the poor usability and multimedia power let the Hi-Grade Notino W5500-1700 down. However, the decent performance and home office software make it well worth a test run.